a.Plug in the power adapter, the yellow LED light means that it is in service mode. b.The small LCD screen will display “PLA” or “ABS”, choosing the correct material, press the “load Filament Button”, and the red LED light will be on, which means the pen is in preheat mode and the temperature display will reflect the real temperature. When the red light turn green, means that the pen is ready to be use. c.lnsert the filament (the filament head should be flat)in the hole that fits and use your other hand to press the “Load Filament Button”, until a small amount of plastics comes out, then the pen will be ready. d.Take on the finger stalls which can effectively prevent hot. Drawing on the PVC Drawing Board. e.when finish drawing, first press the “load Filament Button”, wait the filament come out, and then press the “unload Filament Button”, please make sure the filament is out, otherwise the nozzle will be block. -before insert the filament, please use the scissors to cut the filament head flat. -if the pen is idle by 2 minutes, it will go in to stand by mode, The working light will be off, and the LCD will display SLEEP. To recover from the sleep mode, just press the forward button. ✔️ Perfect Gift for Kids & Adults：Ksera’s 3D printer pen gives you a new way to draw, bringing your art ideas to reality. It is a perfect gift for kids that helps children to improve spatial thinking, cultivate creation and artistic skills. It’s also a great way for parents and children to spend quality time together. ✔️ Easy to Use : We have combined anything you need for 3D drawing in the pen box. Just simply plug-In, heat up, insert the filament and draw. No matter you are a new learner or a expert, you can master it easily. If the pen is idle by 2 minutes, it will go in to stand by mode. 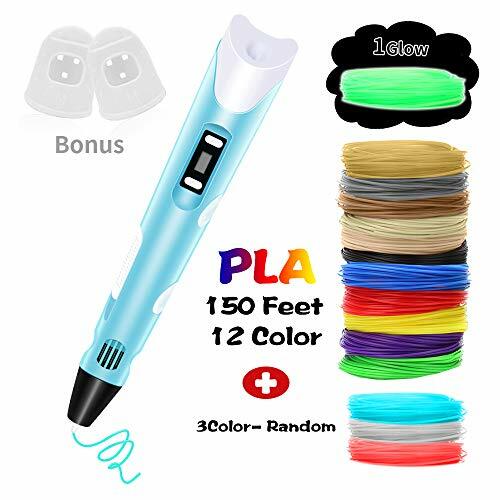 ✔️ Adjustable Temperature and Speed : This 3D printing pen is compatible with both PLA and ABS. We bonus 150 feet PLA filament. Compared to ABS, the PLA filament is more eco-friendly and safer. The LCD screen clearly display the temperature of material, you can adjust the temperature according to the material you use. Besides, the speed controller can help you to increase or decrease the speed of extrusion. ✔️100% Satisfaction Guarantee : Shop with us, 100% satisfaction is guaranteed. 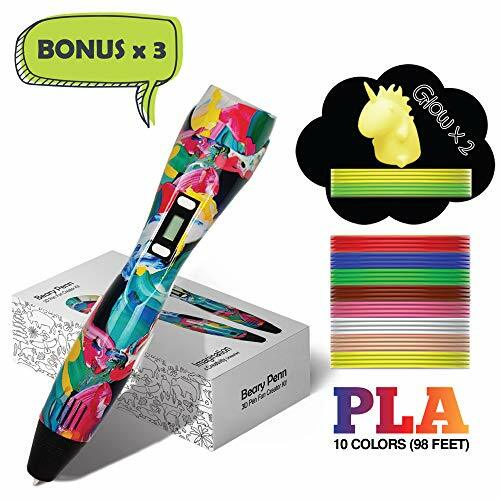 3D Pen come with 30-day money back guarantee . If there are quality problems in case of normal use. Get a free ebook with 250 3D drawing stencils, print them out and start creating! On the seventh day after the parcel has been sent out, we will send the password and website of the E-books to every customer who ordered dikale 3d pen filament. The all-new 3D Pen Filament Refill Kit, features premium PLA material in 20 different colors! Environmentally friendly, odorless – smoother, stronger, and safer than ABS – the new Abonnyc PLA filament presents the BEST option for 3D pen filament refills available on the market. WHY IS PLA MATERIAL BETTER THAN ABS? ✔️【NON-TOXIC AND SAFER TO KIDS】 Compared to ABS, PLA Filament is Non-Toxic and safer to kids. NOT COMPATIBLE WITH 3Doodler. ✔️【GLOW-IN-THE-DARK FILAMENT】This filament pack include 10 glow-in-the-dark colors. After being illuminated with natural light or lamplight, the glow-in-the-dark filament can glow in the dark or at night. Bound to light up not only your room, but also your lives giving you good vibes. ✔️【1.75 MM FILAMENT】 Universal compatible with most 1.75 mm 3D pens and printers(Dimensional Accuracy +/- 0.05 mm). Such as MYNT3D Canbor TRLife Tecboss Scribbler Soyan NEXTECH Amzdeal iLifeSmart Aerb SHONCO MOHOO Anpro Mookie AFUNTA HUSOAR IDO3D TANGMI 3D Pen. 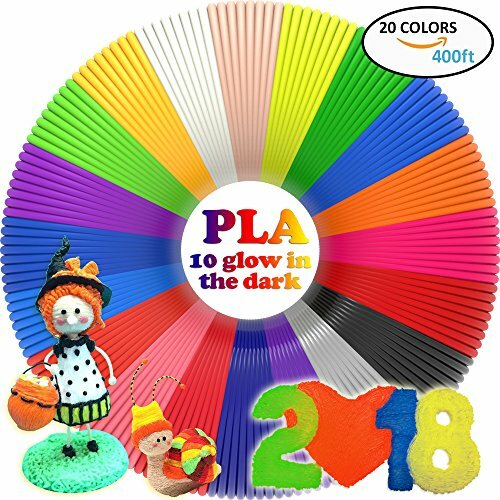 ✔️【20 COLORS 20 FEET EACH COLORS】 20 colors PLA filament to scribble your 3D artistic masterpiece idea. A great gift set for your kids and art lover to have fun with crafting and drawing. After being illuminated with natural light or lamplight, the glow-in-the-dark filament can glow in the dark or at night.